InviroTech Wrap-around Heat Pipes are made as a ‘U’shaped heat exchanger, which hugs cooling coil from two sides in the AHU. 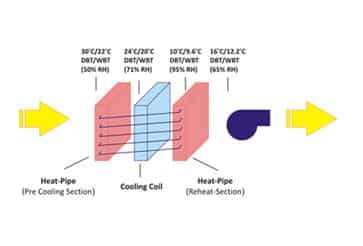 The two sides of Heat Pipe, namely evaporator & condenser, encounter the same air stream twice and provide a pre cooling and reheating in sequence. 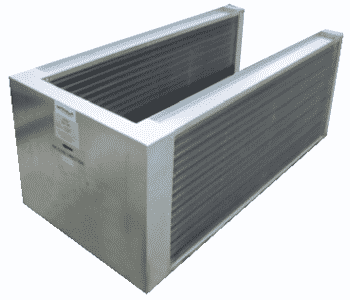 Wrap-Arond Heat Pipes, as the name suggests, are installed having two sections, Pre-Cool Section (evaporator) and Reheat Section (condenser), on two sides of cooling coil inside an AHU. While Pre-Cool Section saves energy by reducing temperature of incoming air, the Reheat section provides supplementary heat which enhances the moisture removal of coil. These Heat Pipes are versatile and useful in a wide variety of building types and have been equally successful in commercial as well as industrial applications. Heat Pipes eliminate the need for ‘expensive to operate’ methods like electric heaters & desiccant dehumidifiers for RH control of around 50-55%, saving the building from being ‘Sick Building’. Heat Pipes saving are huge in terms of Operating Costs. Heat Pipes provide the right humidity indoors, always. Installed inside AHU to suit all AHU some, in most cases, needs no extra room space. Please write to us should you require more information on Heat Pipes.